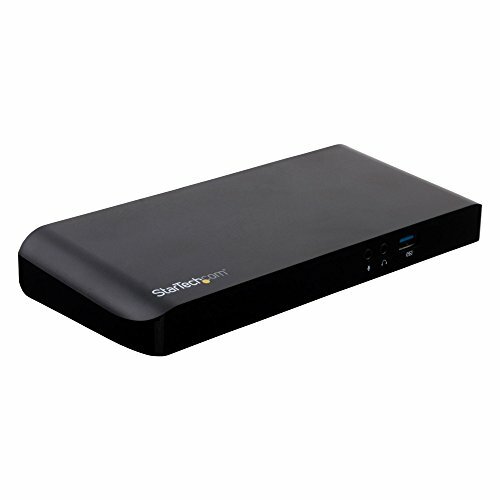 The StarTech.com MST30C2DPPD is a compact and convenient solution for adding more connectivity options to any PC laptop or MacBook equipped with a USB-C port or Thunderbolt 3 port. The laptop docking station takes up very little space on a desk and makes the connection of multiple peripherals easy and efficient. Increase your production and multitask with this dual monitor docking station. Connect two monitors to the laptop dock with the HDMI and DisplayPort ports to view content at a maximum resolution of 1920 x 1200p on each. High resolution content in 4K Ultra HD can be displayed on a single monitor. PC laptops (Windows-based) that support Multi-Stream Transport (MST) can connect to dual displays with a single USB-C cable. The ability to view video and data on two monitors plus a laptop makes it a great choice for designers, IT administrators and anyone working with graphically intense applications. Note: MacOS does not support MST. Connect an assortment of peripherals in addition to your laptop with this USB-C dock. With three USB Type-A ports you can hook up multiple USB-devices such as a printer and hard drive. One of the USB ports is a Fast-Charge port to quickly charge mobile devices. Create a full workstation with the Ethernet port for your router, HDMI and DisplayPort ports to connect dual monitors, and a headphone / microphone jack. With USB power delivery of 60W you can power and charge your laptop and power all your peripherals. This USB Type-C dock lets you connect and disconnect your laptop quickly and with ease. Keep all your peripherals hooked up to the dock and with the included USB-C cable you can quickly connect your laptop to all of them. Standard USB Type-A docks restrict the flow of data and video with a shared bandwidth of 5Gbps. USB Type-C docks, such as this one, allocate data and video separately ensuring optimal performance to increase your rate of production. UNIVERSAL DOCKING STATION: The MST30C2DPPD laptop docking station is compatible with all PC laptops (Windows 7 and up) equipped with USB-C ports or Thunderbolt 3 ports. CONNECT DUAL MONITORS: Hook up two displays to this dual monitor USB-C dock using the DisplayPort and HDMI ports. Laptops that support MST can connect two monitors with a single USB-C cable. Content in 4K Ultra HD can be displayed on one monitor. POWER AND CHARGE: This USB-C docking station delivers up to 60W of power to power and charge your laptop and all your connected peripherals. Use the always-on Fast-Charge USB 3.0 Type-A port to charge tablets and smartphones. MORE PORTS: Connect a variety of peripherals to this USB Type-C dock, which has three USB Type-A ports, a USB-C port, HDMI and DisplayPort ports to connect dual monitors, a Gigabit Ethernet port, and a headphone / microphone jack. FASTER CONNECTIONS: Leave all your peripherals hooked up to the USB-C dock and quickly connect your PC laptop with a single USB-C cable (included). USB-C technology maximizes available bandwidth for video and data for better performance.